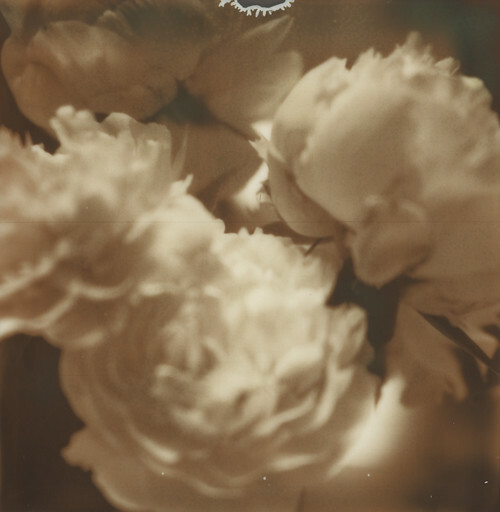 mad orange fools: Peonies on PX 600. I can't even believe how many photos I took of the peonies! I haven't even gotten to the dark pink ones yet. You may not be seeing quite as many flowers on Polaroid film here. Flowers are one of my favorite things to shoot, in part because I am home most of the time and this time of year, that's what is around and what I love. But a few days ago, I counted the last of my Polaroid stash and it kind of made me panic. Okay, it made me panic a lot. Looking at it stacked in the back of the fridge, I felt like I had plenty left, but counting it made me realize that it really isn't going to last forever. And yes, in the back of my head, I have always known this little fact, but the reality is drawing near and the thought of getting down to my last pack of 600 film is just so sad. That's mostly what I am talking about here. The 600/779 film. I've been using 600 film for so long, it's like a trusty companion. I love the peel-apart film too, but since Fuji makes it, I am not so worried about running out. In fact, I really love the Fuji film. Because it is self-terminating, it makes it a lot easier to take photos on the go since they don't have to be peeled right away. And I love the new films from The Impossible Project, but since they aren't ten bucks a pack like 600 film used to be, I'm never going to be able to buy a lot of it. And in turn, I'll probably feel like I can't shoot it so freely either. So I am thinking I need to slow down a bit. Not shoot everything with the Polaroid. Save it for the road trips and hikes and what not. But it's going to be hard. I'm not anti-digital, it just doesn't do the same thing for me. I love my other film cameras too, but again, it's just not the same thing. But I am thinking I am going to have to start using my Pentax K1000 a lot more. I do love that camera. Sigh. Thinking about the last of the 600 film truly makes my heart hurt. I have the same feeling of sadness when I look at my depleting stock of 779/600. It makes me want to cry.